Metal Works — Wayward Roots & Co. 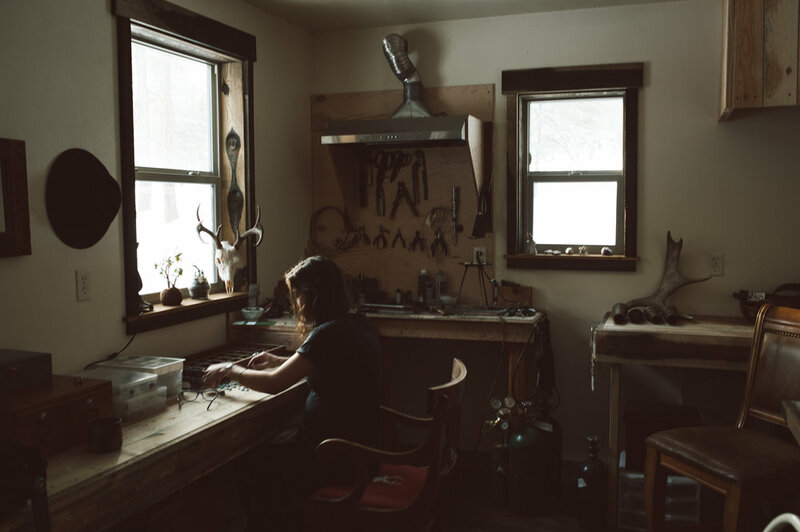 Earlier this year we were welcomed into the home of Jessica Lewis of Ruby and Revolver for an afternoon in her studio, filled with discussions of her creative process and practices, wandering into life stories and hopes for the future of her business and growing family. We followed a road through the Bitterroot Valley, turning toward the mountains where a little home with reclaimed barn wood doors was tucked away in the woods. Upon our arrival, myself and fellow photographer and friend Nicole Mason, were greeted by Jess and one of her pups, the warm scent of the wood burning stove drifting from within. Jess is beaming in her 8th month of pregnancy as she beckons us in out of the chill of the January morning. She embraces us in a deep hug of hello, a simple gesture she has extended each time we have met, and one that embodies the essence of her nature. The house is small in appearance, a quintessential mountain abode with rustic wood siding, illuding to the comforts it holds within. Upon entering the main room, the acid-washed concrete floors draw the eyes across the room toward the vaulted ceilings, opening the space to allow for their built-in climbing wall and loft bedroom. A wood burning stove is tucked away in the corner, the fire rolling out the heat for the house, a dog bed positioned off to the side to receive its warmth. 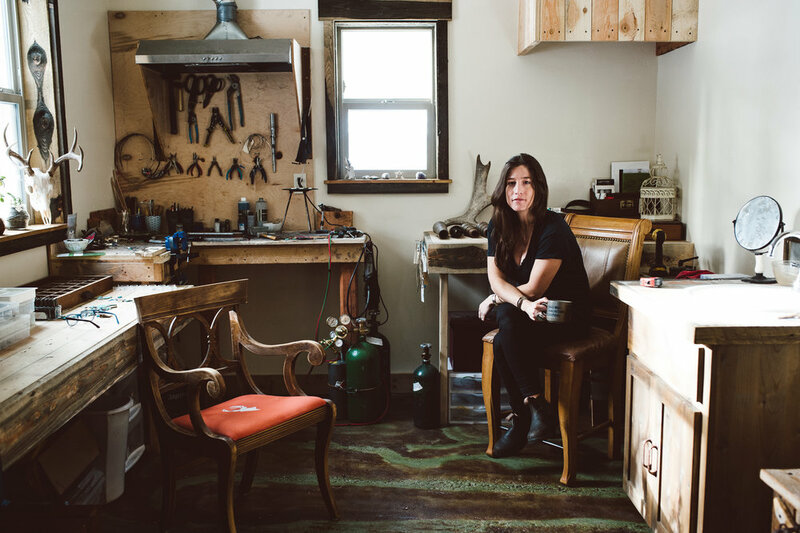 Jess leads us to her studio space, located in the back room of her home where she designs and constructs her jewelry pieces for Ruby and Revolver. 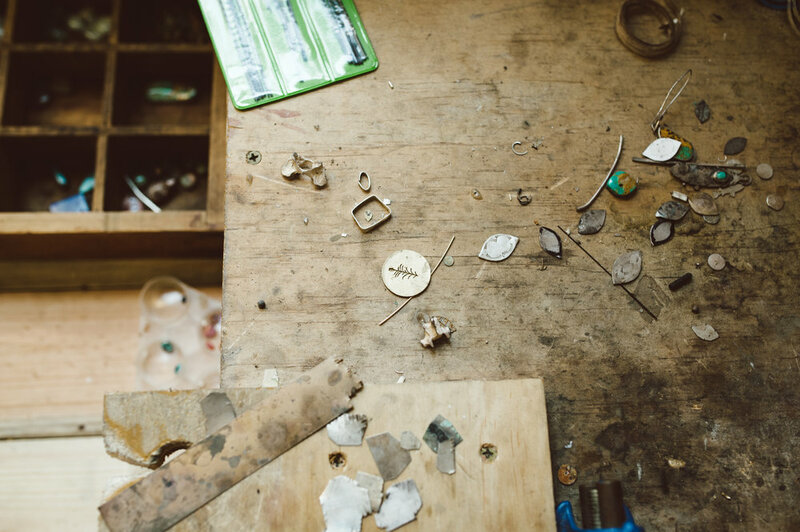 The wooden work benches are lined with boxes of various metal materials: pendants, silver sheets and strips, wires, rings, and a collection of weathered jewelry to be refurbished and given new life. Tools of the trade hang from the walls and tuck beneath the benches. 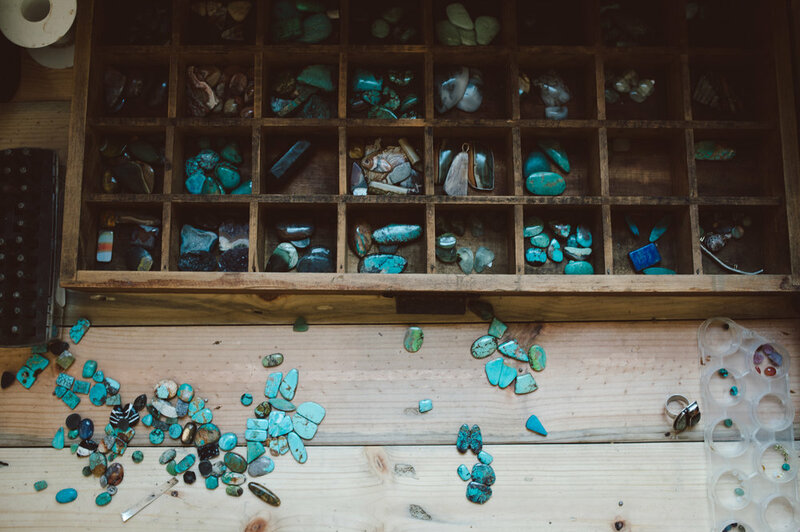 The array of stones rest in the window light, awaiting inspiration and their matched settings. Their hues radiate with the vibrant and ranging tones of the West, the landscape that has inspired and defined the heart of Jess's work. "I like that the metal has a history, that it has lived before... but I also just think that, as a culture we throw so much away, things with so much life left in them. And it’s my hope that we can start to turn the tide there." 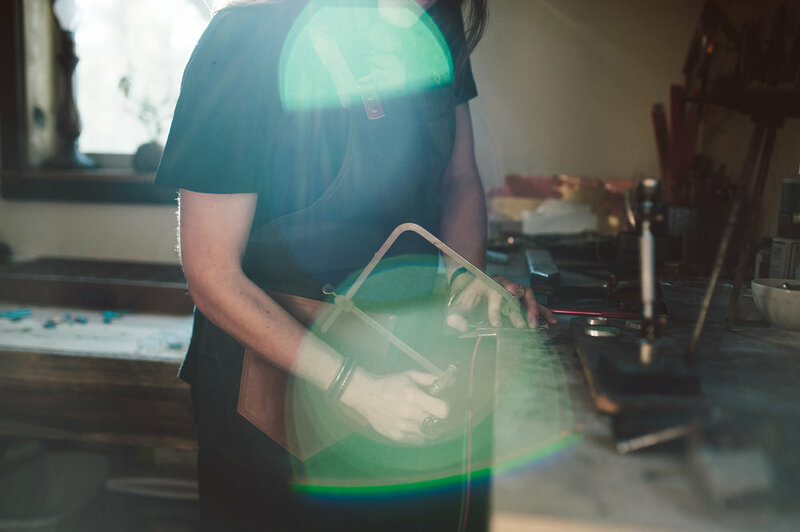 The pursuit of becoming a silver smith was a slow development stemming from curiosity and a childhood exposed to her father's own metalwork as a gunsmith. She began seeking out the needed tools by searching pawn shops and accepting hand-me-downs, gradually acquiring the necessary pieces. With little knowledge of this craft, she just as simply began, finding her way through research of traditional practices, and a lot of experimentation toward what would become the foundation of Ruby and Revolver. 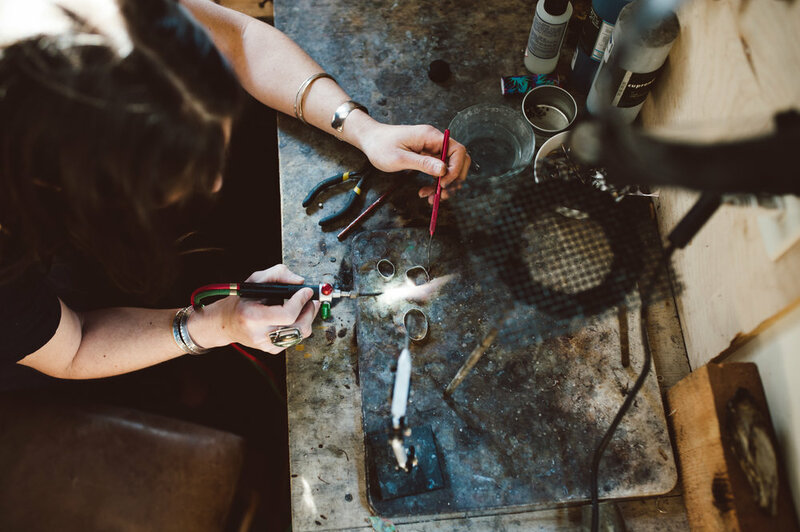 Jessica opened her Etsy shop back in 2011 when she began distributing her metalsmith creations. Her reputation and the demand for her unique designs has grown steadily, as has the scarcity of her pieces. Being the sole show-runner of Ruby and Revolver, the rate of production is met with a slower, mindful and controlled pace in contradiction to the standard fast pace of the mass consumer industry. This mindset allows Jess more fluidity with her work life balance. Not only does it preserve her work ethic, but is more forgiving on the creative inspiration, giving her the time to thoughtfully design and construct each piece. The sales end of her work is often presented in batch clusters periodically ever few weeks. A dozen or so pieces she has prepared, often falling into custom themes, will be announced through her social media platforms, to be found for sale through her Etsy shop at a specific date and time. This strategy is also why her pieces have gained a bit of notoriety for their scarcity. It is not uncommon for the shop to sell out in under 20 minutes. She can also be found occasionally participating in select maker's events where she is always met with tremendous local support. This central belief in mindful practice was evident during our time together, both in her studio as well as her approach to work and life. Throughout the afternoon we wandered out into the snow to walk the trails etched across her property, letting go of time while getting lost in lengthy conversations of our childhood, previous jobs, marriage and partnerships, photography, homebuilding, life in Montana, wild places, philosophy, pregnancy and parenthood. Our conversations were followed by a shared light lunch of tea, toast, and tomato soup; the simplest of comfort foods hold such a deep gesture of care and reinforce the tranquility of our time in this corner of the woods. As we re-entered the studio for a time, Jess returned to the bench to select a set of stones that needed sorting. Placing them on the surface before her, she would delicately handle them, feeling their texture and shape, examining how the light fell upon them, altering and highlighting unique tones, awaiting inspiration as to what they each would become. 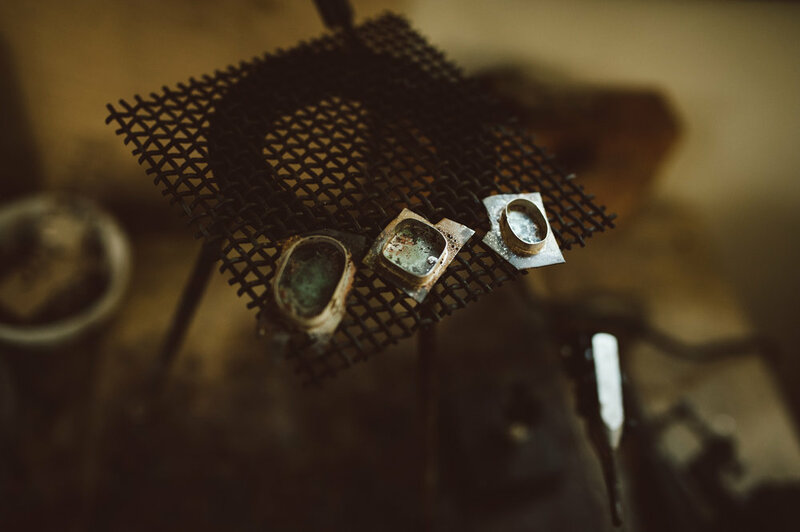 She describes this process and more of her story and experiences through metalsmithing in our interview below. 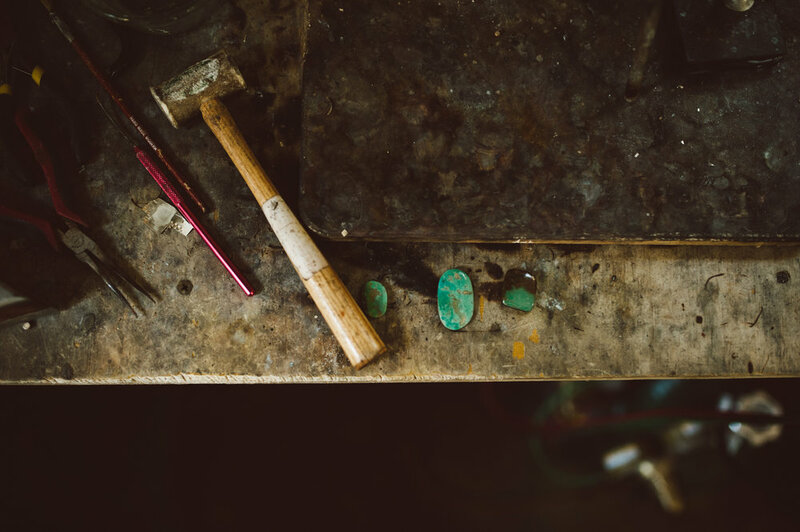 Let’s start at the beginning: Describe your journey to becoming RubyandRevolver and the birth of your metalwork. For as long as I can remember I’ve created. I’ve strung beads together, sewed my own clothes, painted etc...and I’ve always been drawn to working with my hands. My father is a metal worker so I had some limited exposure at an early age, and although I never had the chance to learn from him, I think he helped to instill in me a fascination with metal manipulation. I love that it’s an age-old craft, with a rich history, and one that has helped to shape the human story. "I’d like to give that gift to my daughter, to our small family. The gift of nature. The gift of more time. Beyond that... I don’t hope for much more than to be able to continue support us with my art." You use a lot of reclaimed metals in your pieces as well as locally sourced stones. Due to consistency and availability of quality materials this can, at times, be difficult to maintain. Do you believe you will be able to sustain this practice within your work long term? Why is it important for you to uphold the approach of using reclaimed and locally sourced materials? It can be difficult! And it’s certainly part of the reason my pieces are one of a kind. I let both the metal and the stone dictate what it is I make from them. The options aren’t endless, I’m working within the constraints of brittle, uneven, and often damaged metal and trying to make something beautiful from that. I have found that product is out there, I just have to dig a little deeper and work a bit harder for it. I hope to not only continue to use reclaimed material, but increase my use as well. I’d like to eventually use only reclaimed material, and although I’m close, I’m not quite there yet. I like that the metal has a history, that it has lived before... but I also just think that, as a culture we throw so much away, things with so much life left in them. And it’s my hope that we can start to turn the tide there. That we can see the beauty in reusing, reclaiming and repurposing... that we take steps to be more sustainable for our kiddos, for our planet. How has your environment guided your creative process? I draw very heavily from the outdoors, from flora and fauna... from wild open spaces. I do my best to be outside as much as possible, for my mental health...as well as my craft. It’s where I draw my greatest inspiration. What other sources do you draw inspiration from? The old west. Specifically, from old metal working and blacksmithing techniques. From the drive to create things that are built to last, right down to the aesthetics. I like pieces that look handmade. I like them a little rough around the edges. And I also like knowing that I can create using the most rudimentary tools if necessary. I like the process. The knowledge that I’m using the same tools of metalsmiths. How do you describe your personal style and design aesthetic? What are a few key principles you keep in mind? I try to keep my pieces organic, and with an air of simplicity. I don’t want too many elements in competition for your eye. If I’m using multiple stones, I want the setting to be simple, or conversely, I’m piercing something ornate I’ll keep the stones to a minimum. I use only natural, and preferably reclaimed stones. Describe your process for creating a piece of jewelry, beginning with inspiration to reaching your store front. Honestly... it varies wildly from piece to piece. Some days I sketch and draw heavily from the pages and illustrations in my journal. And other times I simply see a pattern, a color scheme that I want to recreate. And still other times I simply sit down with a clear mind, and let my hands move as they will. As a business owner in the digital age, you have the ability to reach potential customers all over the world. Why do you believe it is important to nurture and invest in your local community? In what ways have you and your work grown from the influence of a strong community, online and locally? What fear or professional/artistic challenge keeps you up at night? The sheer amount of work to be done- the feeling that there is always more to do. And the knowledge that I can’t be 100% percent for all of it. From creating, to marketing, to ordering, to corespondence, to photography... it never ends. I love all of the parts that make up the whole...and I’d like nothing better than to pour myself into each one. But, it just can’t be done. I fall short. And that keeps me up many a night, but it also keeps me moving forward. Since beginning RubyandRevolver, what has been your greatest accomplishment? Continuing to create with an infant in tow! What are some of your goals/dreams for the future of RubyandRevolver? I’d like to take R&R on the road. I imagine a little pull behind trailer, converted into a studio. Parked in National Parks and at crags near and far. I’d like to give that gift to my daughter, to our small family. The gift of nature. The gift of more time. Beyond that... I don’t hope for much more than to be able to continue support us with my art. Because I don’t just don’t know how not to. You can keep up with Jess's stories, updates on her shop, local events, and the latest pieces on her Instagram account @rubyandrevolver or through her website www.rubyandrevolver.com.